0: Preface: an overview of the structure of the book, and a guide to who should read which parts. 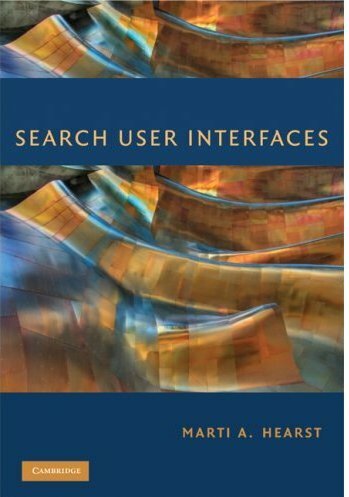 1: Design of Search User Interfaces: introduces the ideas and practices surrounding search interface design, places modern design in a historical context, and summarizes design guidelines for search interfaces. 2: Evaluation of Search User Interfaces: includes informal studies, formal studies, longitudinal studies and log-based analysis including bucket testing. Presents extensive device about how to avoid evaluation mistakes. 3: Models of the Information Seeking Process: summarizes the theoretical models about information seeking, and discusses information needs and query intent. 4: Query Specification: includes textual queries, natural language questions, query specification forms, dynamic feedback, and operators and commands. 5: Presentation of Search Results: includes document surrogates, properties of results listings, summaries (snippets) as used in search results and user response to search results ordering. 6: Query Reformulation: includes the reasons for reformulation, spelling suggestions, automated query refinements and expansions, using popular destinations, relevance feedback, and more-like-this. 7: Supporting the Search Process: a capstone to the previous three chapters, describing interfaces that encompass and augment the search process, including search starting points, history, re-finding, and sensemaking. 8: Integrating Navigation with Search: includes using categories to sort, filter, and group search results, table-of-contents views, faceted navigation and search, and clustering, concluding with the strengths of catgories vs. clusters in search and browsing interfaces. 9: Personalization in Search: explores the emerging area of using individual searchers' information to influence search results, including implicit vs. explicit recommendations, customization, and search agents. 10: Information Visualization for Search Interfaces: the first of two closely related chapters. Includes foundational principles for visualization of abstract information, why visualization of text is difficult, how visualization has been used in search interfaces, and why in most cases it is not successful from a usability perspective. 11: Information Visualization for Text Analysis: the second of two closely related chapters. Describes visualization for analytical studies of text, which is a more specialized task than search. 12: Emerging Trends in Search Interfaces: includes mobile search interfaces, multimedia search, social search, and the increasing length of search queries, leading to more natural expression of information needs. By permission of Cambridge University Press, browsing the contents of the book on this web site is free. Users may make one hardcopy of the contents of the book for personal use, but not for further copying or distribution. Users may link freely to this site but may not post any material from the book on other web sites, other than short excerpts with attribution as permitted under fair use.